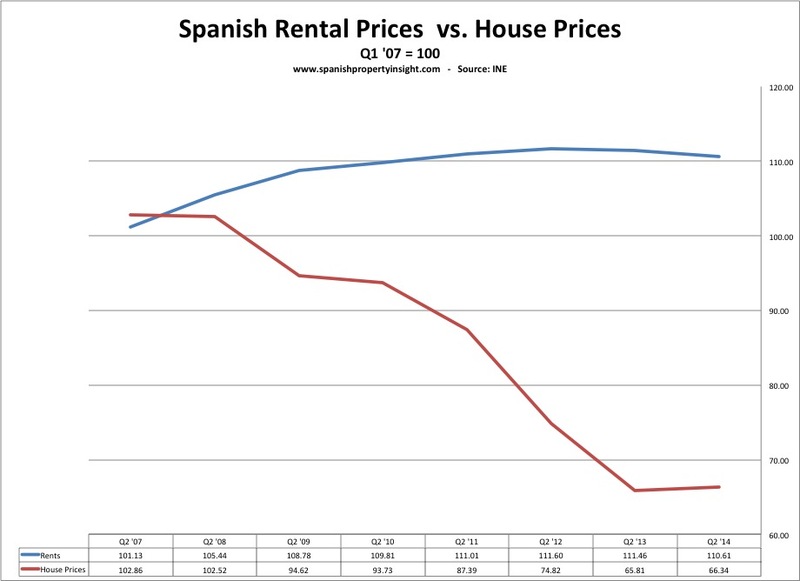 Average Spanish rental prices fell 0.7 per cent over 12 months to the end of August, reveals inflation data published yesterday by the National Institute of Statistics (INE). 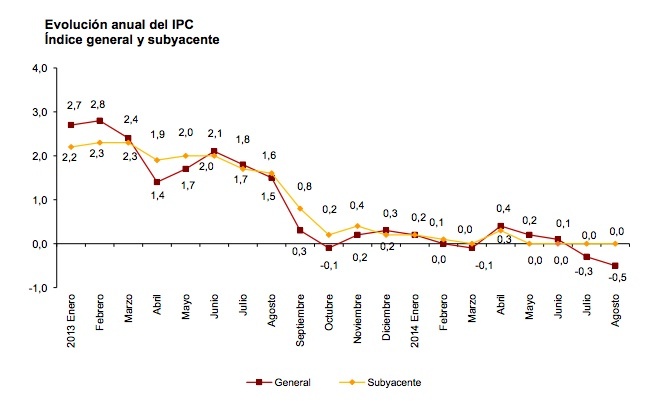 Average rents in Spain have now fallen every month since April last year, as illustrated by the chart above. The consumer price index in Spain was -0.5 per cent in August, which means Spain is in deflation, and has been for two months. Deflation is bad news for debt dynamics, as it increases the real value of debt. At -0.7 per cent, the average rental cost fell even more than the consumer price index, compounding the real decline in rental prices. 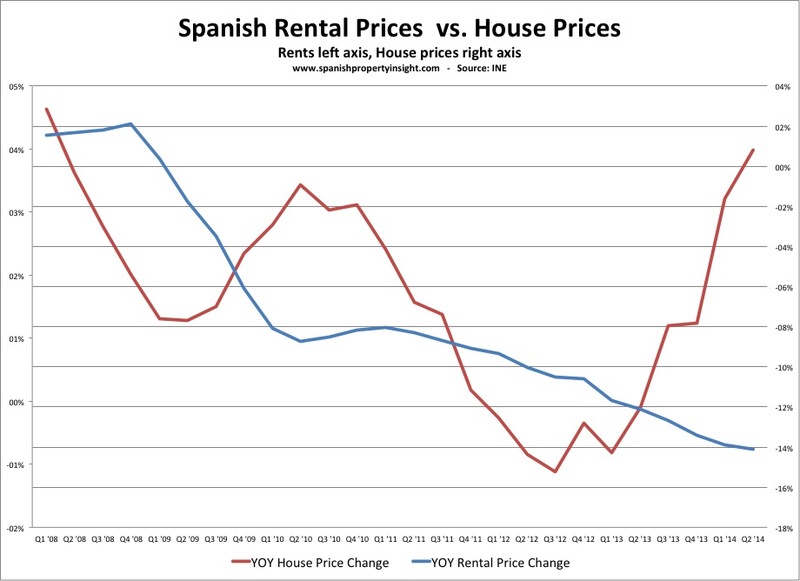 Rents fell last month in 15 out of Spain’s 17 regions, but rose a fraction in Catalonia and Asturias. Compared to house prices, rents are now in negative territory whilst house prices are rising for the first time since the first quarter of 2008, meaning that rental yields are shrinking. The following chart compares changes in rental prices and house prices using data from the INE. Falling rental yields diminish the appeal of property as investment, unless rising capital values compensate investors, which is hardly the case today in Spain. 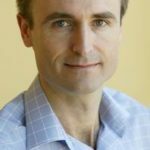 However, rental yields have improved considerably since 2007, as rents have risen 10 per cent whilst house prices have fallen 33 per cent, if the INE’s figures are to be believed. 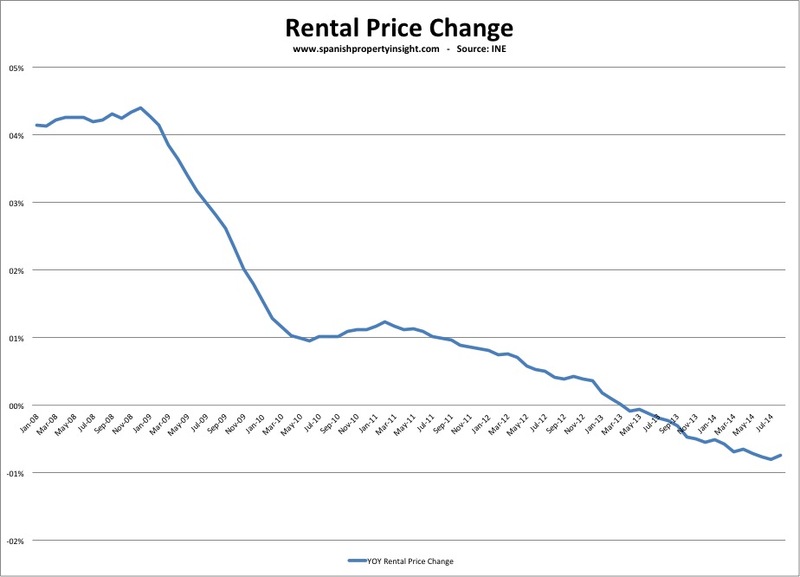 Falling rental prices reflect the continued economic crisis and levels of supply and demand. There is an overall surplus supply of rental properties in Spain, but at the same time agents report there is a shortage of attractive rental properties in prime areas.